For most of his life, Stanley Keely, Ph.D., has been a seeker of spiritual knowledge. This drive has become more focused over the last 40 years and has particularly intensified over the last 17 years when he developed his own personal philosophy, which he refers to as “Stan-ism” (named after himself). 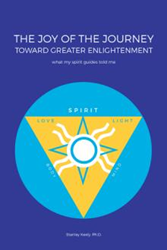 In his debut book, “The Joy of the Journey toward Greater Enlightenment: What My Spirit Guides Told Me” (published by Balboa Press), the author narrates his life, his search for truth and his interaction with the spiritual realm. Readers may visit https://www.balboapress.com/Bookstore/BookDetail.aspx?BookId=SKU-001168362 to learn more about the book. “The Joy of the Journey toward Greater Enlightenment” is a memoir and guidebook that explores a man’s journey in spirituality. In here, Keely shares his experiences in life and death. It speaks to the presence of the divine, spiritual realm leading him toward a sense of self-awareness and enlightenment. He also shares how he has learned to communicate with his “spirit guides” as he ponders on important spiritual issues such as God, creation, suffering, purpose, consciousness and more. Combining a lifetime of study, experience, experimentation, discovery, discussion, and a near-death, out-of-body experience, Keely hopes to provide a unique perspective on significant spiritual questions that should appeal to those interested in personal growth and the evolution of consciousness. Stanley Keely, Ph.D., was born in rural western Pennsylvania where he spent the first 20 years of his life. In 1966, he received a bachelor’s degree in chemistry and in 1970 earned a doctorate degree in bioorganic chemistry. Throughout the ‘70s, he taught and did medical research at Vanderbilt University. In 1979, he left academia and accepted a position as a senior scientist with an American multinational pharmaceutical company. He later became a director of strategic research and product development with another pharmaceutical company. In 2002, he retired from cooperate life and went on an eight-year spiritual quest studying and experiencing both eastern and western spiritual consciousness. To be closer to family and friends, he moved to rural southern middle Tennessee in 2011 where he continues his spiritual studies, meditation and communication with his spirit guides.